People don't want real China for weddings and other events anymore. If you're looking for disposable plates for weddings, then the Glamour collection is a wonderful example. It features a white with metallic silver and blur border to create an amazing presentation. The Glamour collection of plastic plates has a unique style when it comes to disposable plates for weddings. It's attractive and provides all the benefits of China with the ease of plastic. Available in 10.25" and 7.5" plates. 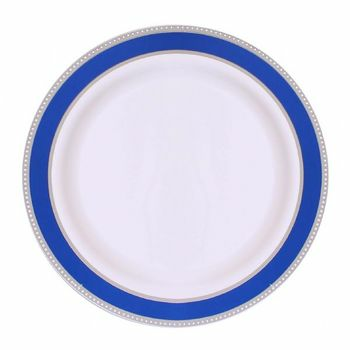 Glamour Collection 10.25" White w/ Metallic Silver and Blue Border Banquet Plastic Plates 10ct. Glamour Collection 7.5" White w/ Metallic Silver and Blue Border Salad/Dessert Plastic Plates 10ct.